The Nokta Fors Gold+ is one of the latest gold detectors to hit the market. It is made by Nokta Detection Technologies based in Istanbul, Turkey. While the company has been making metal detectors since 2001, they have been a relatively unknown company by folks here in the US until recent years. In the past few years they have really started to make a name for themselves in by making several quality metal detectors used for both gold prospecting as well as coin/relic hunting. My first impression of the Fors Gold+ was that it was a solidly built detector. The overall weight of the detector is 3.9 pounds, and it balances quite well. I would have no trouble swinging this detector all day long, especially compared to heavier Pulse Induction (PI) type detectors that I am use to swinging. It operates at 19 kHz, which puts it in the same range of sensitivity as several other popular gold detectors such as the Fisher Gold Bug Pro and Garrett AT Gold. The control settings on are adjusted on the side of the control box, with a large display screen and large buttons that make it simple to make adjustments. The Fors Gold+ can be operated in three different search modes; General, Fast, and Boost. General mode, which is often called “all metal mode” on some detectors, is usually the best choice when detecting for gold nuggets. It offers the best depth and does not discriminate any targets. 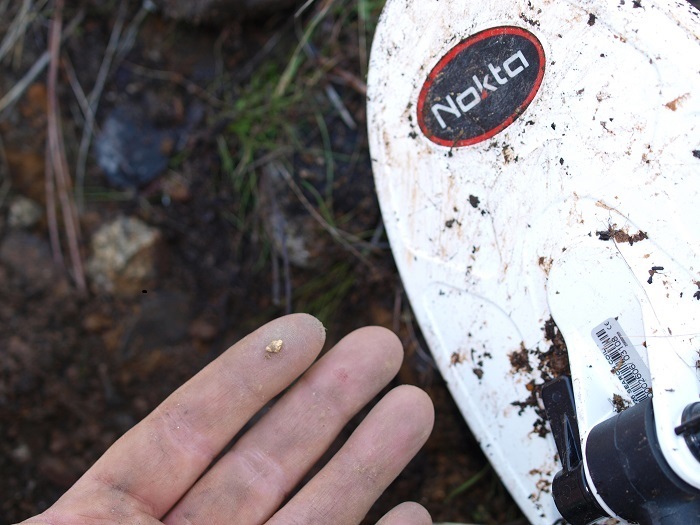 A signal from the detector will display a numerical display on the handle that will help you determine what type of metal the target might be, but regardless of the detector it is generally best to dig all metal targets when you are in gold country. Fast mode was designed to be used in gold country that has extremely high mineralization and many hot rocks. This is a 2-tone mode which will basically give you a “good” or “bad” signal. You will get less depth with Fast mode than you will with General mode, but it may be needed in harsh ground conditions or areas that are extremely trashy where you simply can’t dig all of the targets. Boost mode is another 2-tone mode that will provide better depth than Fast mode, but will still cancel out hot rocks and other ground noises better than in General mode. Both Boost and Fast will give low tones for hot rocks and iron, and a higher preset tone for “preferred” metals such as lead and gold. Of course, with any detector I would highly recommend that you dig ALL targets if you are able to do so, especially when you are still learning how to operate the unit. There are several other features on the Nokta Fors Gold+ that are not available on similar very low frequency (VLF) detectors in the same price range. As with all gold detectors, the Fors Gold+ can be ground balanced so that it can operate properly in a variety of soil conditions. With this detector, you have a choice to use automatic ground balance or ground tracking. I prefer to do an automatic ground balance while I am detecting, but some users may prefer to use ground tracking. Both ways work fine, but I found ground tracking to produce a bit more ground noise than was necessary. Simply doing an automatic ground balance frequently while I am detecting seems to work for me. I really like that it has an adjustable threshold tone, similar to my Minelab GPX. This simply lets you chance the tone of the constant threshold hum in your ear. It doesn’t affect the performance of the detector, it simply allows you to set the tone that you prefer to listen to. Other features include a pinpointer setting that will help you locate the target in the hole once it has been detected. This is handy for quick recovery, although I find that I don’t use it much because with the small coils that are used on the Fors Gold+, it is simple enough to identify determine the location of the target without it. It also has an LED flashlight mounted on the handle. Although I haven’t yet hunted at night using this detector, I could see how that would come in handy. One warning I would give is to pay attention not to accidentally turn the LED light on by mistake. You won’t notice that it is on during daylight hours, and I’m sure leaving it on makes an impact on the battery life. The rain this winter has limited my chance to get out and metal detect for gold nuggets recently, but a break in the weather allowed me to get out and hunt one of my old nugget patches last week and get a chance to try out my new Nokta Fors Gold+. For my first trip with this metal detector, I took it to an old nugget patch that I had worked many years ago. Actually, it was one of the first nugget patches that I ever found with a metal detector. At the time I was using a Whites MXT, which is a decent multi-use detector, but certainly not as sensitive as most other gold detectors on the market so I was optimistic that the Fors Gold+ would squeak out a few more nuggets from this location. The gold nuggets I had found here at this spot is relatively small, but they are chunky enough that they usually give a good signal response. I set the detector up in General mode and was using the 5 x 10 DD search coil. This is my preferred coil size that I like to use for all VLF detectors. For this area, I had the sensitivity set at 75. I probably could have set it higher but I like the stability at this setting. It didn’t take long to find the first nugget. Of course since I had already detected this area before I had a good idea of where the gold was already located, so I wasn’t surprised that I found some gold so quickly. l had already cleaned out a lot of the trash targets already. 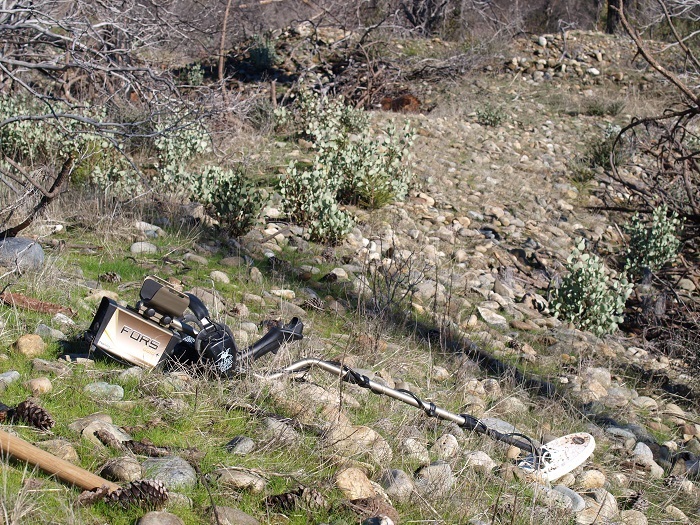 This location is in northern California fairly close to a large town so there is always some new trash showing up. I dug quite a few bullets throughout the day. I did not find the target ID to be particularly stable. The numbers displayed seemed to bounce around quite a bit until the metal target was basically right under the coil. Even an inch or two of depth would limit the consistency of the number displayed. However, since I was operating in General mode and planned to dig everything anyways this was not really an issue for me. Plus nearly all of the trash in this area was lead bullets, so the ID number was always in a range that indicated a “good” target anyway. I am interested to see how well it works when running in Fast or Boost modes in the future. I was lucky enough to score a nice little nugget using the Nokta Fors Gold+ on my trial run. It was a solid, chunky little piece of gold that gave a nice signal. It was found in an area that had been mined by the old-timers so there was a decent amount of exposed bedrock. The depth was probably around 3". While I will still need to have a many more hours using the Fors Gold+ before I am proficient with all its various settings, I am confident to say that it is a very capable detector for the goldfields. It operates with good stability in ground that would be challenging for the average multi-purpose detector. Keep in mind that the Fors Gold+ is a VLF detector, so it will not detect deeper targets like PI detectors will. It’s best use is in areas that have relatively shallow soils and exposed bedrock where you can use its sensitivity to small gold to detect gold from bedrock cracks. For the price, the Fors Gold+ seems to be a great choice for gold prospectors.